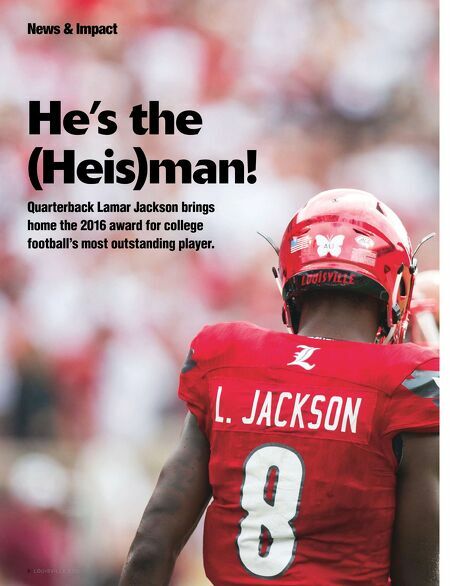 W I N T E R / S P R I N G 2 0 1 7 U O F L M A G A Z I N E | 9 H A P P E N I N G H E R E S OPHOMORE LAMAR JACKSON made history on Dec. 10, when he became not only the first Louisville football player to win the Heisman Trophy, but the youngest player ever to win the award. During the ceremony, in addition to other influences, Jackson credited his first coach — his mother, Felicia — for his incredible success on the field. Guiding the nation's top scoring offense, Jackson fi nished the regular season setting ACC and school records with 51 touchdowns (30 passing, 21 rushing), rushing yards by a quarterback with 1,538, and rushing touchdowns by a quarterback with 21. 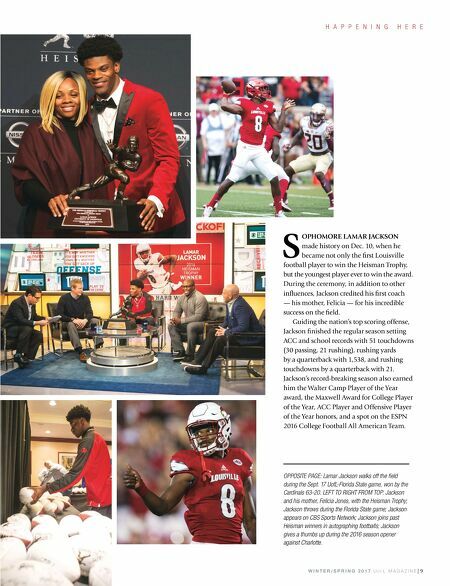 Jackson's record-breaking season also earned him the Walter Camp Player of the Year award, the Maxwell Award for College Player of the Year, ACC Player and Offensive Player of the Year honors, and a spot on the ESPN 2016 College Football All American Team. OPPOSITE PAGE: Lamar Jackson walks off the fi eld during the Sept. 17 UofL-Florida State game, won by the Cardinals 63-20. LEFT TO RIGHT FROM TOP: Jackson and his mother, Felicia Jones, with the Heisman Trophy; Jackson throws during the Florida State game; Jackson appears on CBS Sports Network; Jackson joins past Heisman winners in autographing footballs; Jackson gives a thumbs up during the 2016 season opener against Charlotte.